Check the rest of this section for more details. (e.g. the MemberOf relation). And they need to do this in a way where you can add and remove certain memberships without touching other memberships. That is because the responsibility of the membership attributes of a user in most companies is distributed to different parts of the organization. who gets a membership to the group manageSystems. The ldap_principal type supports all these operations. you can specify which users must be present in a certain group. When you use this property, Puppet leaves all other group memberships as they are. The reverse of this operation is the property absent_in. Like the word says, it makes sure the specified user is not available in a certain group. Like I said, a responsibility of the LDAP principals is mostly shared across the organization. But you want to be sure your part of the LDAP tree only contains the ones you think are needed. Puppet has purge feature that allows you to remove resources that are not specified in your manifest. But using this on LDAP, would also remove entries you don’t manage. So there needs to be a solution for purging just a container you manage. means every entry not present in your manifest, will automatically be purged. This means your LDAP can remain clean and free of dangerous unwanted entries. But not only unknown entries can be dangerous, also unknown attributes can be a security hazard. When you set this to true, all attributes not specified in these LDAP entries, are removed. Thus making sure only attributes specified in your manifest are found in your part of the LDAP container. Some LDAP servers allow you to set the password value of an entry to a value that is encrypted before it is sent to the server. This is inherently unsafe. Therefore in most larger organization, the password encryption is done by the LDAP server. But because Puppet needs to manage encrypted attributes in an idempotent way, we need some way of control over the encrypted value. 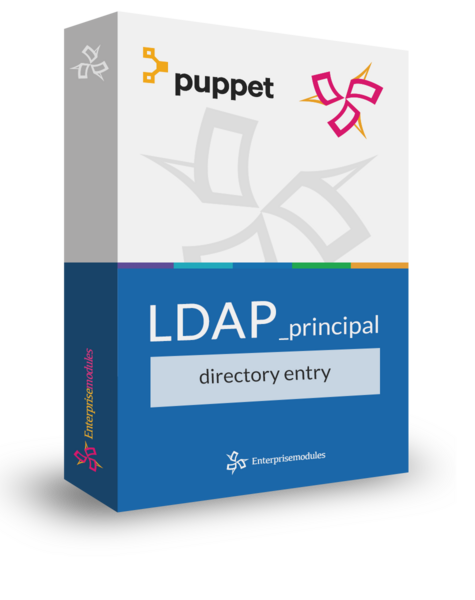 The ldap_principal Puppet type has support for transform property. Using this property, you can manage how Puppet transforms specified user values before comparing it to the current state. Our license manager is very flexible. If you have special requirements, please contact us so we can discuss other options. A valid entitlement for usage. Runs on most Linux systems and most versions.